A UFO “Tall Ship” the size of the moon appears in an image captured from the NASA Helioviewer by a prominent UFO watcher on Tuesday — and this is not the first time, according to UFO buffs, that a gigantic UFO has been sighted on or around the sun. 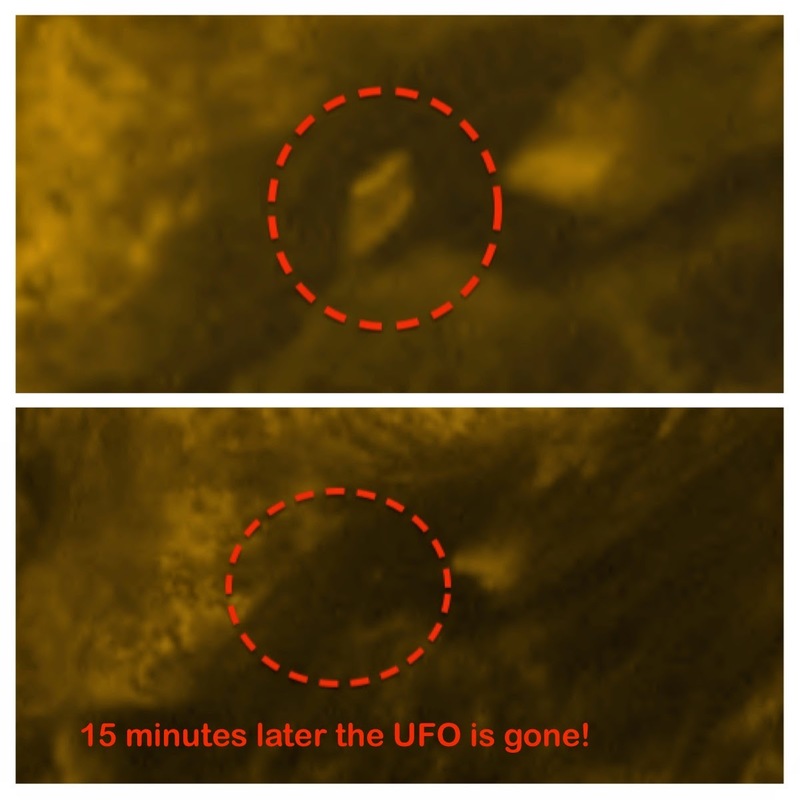 For example, last December, the same well-known UFO hunter, Scott Waring, said that he had discovered a similar “moon size UFO” exiting a dark spot on the sun’s surface — again as seen through the NASA Helioviewer, an online site that is fascinating in its own right, even for those not prone to seeing UFO-like phenomena hidden in solar imagery. And again in Christmas Eve, Waring was poring over Helioviewer images and saw what he believed to be a UFO “Mothership,” also about the size of Earth’s moon, blasting out of the sun’s surface. But how would this even be possible? Even at a relatively cool 10,000 degrees Fahrenheit on its surface — compared to 28 million degrees in the sun’s core — the sun would appear to be far too hot for any object to survive without being immediately incinerated. 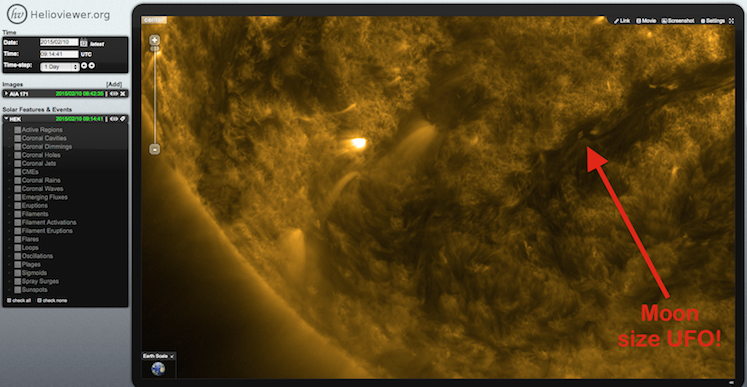 As for his latest solar UFO sighting, Waring posted this screen capture from the Helioviewer site. The time of the mysterious UFO “Tall Ship” image was 9:14:41 a.m. UTC on February 10 — or 4:41:14 a.m. United States Eastern Time. 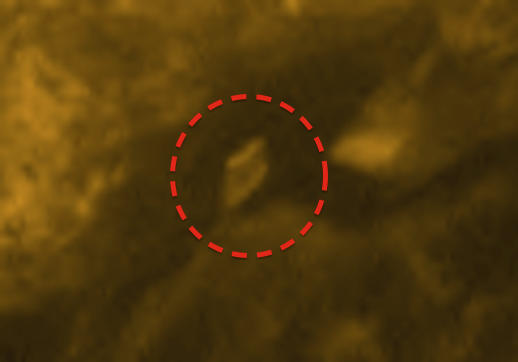 Waring also noted that when he looked at an image in the Helioviewer from just 15 minutes later, the UFO image had disappeared. While this latest supposed UFO sighting collected from the NASA Helioviewer was not the first such anomaly spotted by UFO hunters, it is certainly guaranteed not to be the last. Needless to say, NASA has not bothered to comment on any of these UFO sun images.